In an era where much of the country seems to rarely think about life insurance, we felt it was important to spread the word – someway, somehow. In support of Life Insurance Awareness Month, we decided to add a new element to our campaign this year and take this important message to our employees. After all, they play a key part in ensuring exams are scheduled and performed, interviews are completed, specimens are processed, policies are issued fast and applicants receive a pleasant experience. Without them, our business would not succeed. 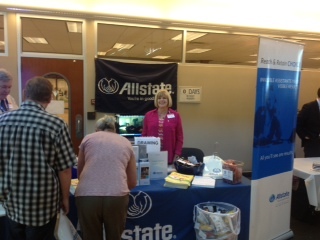 On September 5th, we hosted our first Life Insurance Fair for 1,000 of our laboratory employees. We invited 12 local Kansas City-based agents to our Lenexa laboratory to participate. Each agency set up a table that included insightful information for our employees who may be thinking about purchasing life insurance, or updating their policies. We, perhaps naively, assumed our employees all understood the importance of life insurance, but found even some of our own employees were under-educated about the significant role life insurance plays. One gentleman expressed, “I have a wife and two kids and never really thought about it.” The employee was referred to the LIFE Foundation’s website so he could view their videos, which we also have playing in our lobby. We received positive feedback from both our employees and our agents. The agents were excited to have conversations with individuals about a product they are so passionate about. Agents were setting up appointments on the spot, and also generating leads for future calls. Some even took information down, ran quotes that night and brought them back the next day. Employees were grateful that we provided them education to make sure their families are adequately protected. This month is about being a leader for our industry and informing all individuals about the importance of life insurance. Every conversation agents have with individuals helps as we climb this mountain on our collective quest to generate awareness of the importance of life insurance. We are pleased with the results of our Life Insurance Fair and are already looking forward to making it bigger and better for 2014. Next post: What is the ‘hidden healthy’ and how does it aid in underwriting?